British Open Golf Championship golf tournament. Welcome to our tournament page for the oldest championship in tournament golf -the 2013 British Open Golf Championship. Muirfield is the host course located on the Firth of Fourth on the east coast of the Scotland for the 142nd edition of the British Open - the oldest championship in professional golf. In 1873 the British Open left Prestwick (Scotland) as the lone host course -to a rotating format giving the St. Andrews Old Course it's first spot in that new rotation of host golf courses. At that time the R & A and Honorable Company of Edinburgh Golfers replaced the winners Championship Belt with the Claret Jug -arguably the most coveted trophy in golf today! Ernies Els is defending and also won the last time that the Open was held at Muirfield in 2002. Padraig Harrington won the 2007 & 2008 British Opens with Stewart Cink beating Tom Watson in a playoff at Turnberry in 2009. 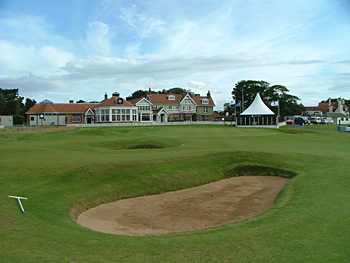 Louis Oosthuizen of South Africa won it at St. Andrews in 2010, with Darren Clarke winning at Royal St. Georges, and Ernie Els and will be defending here after winning last year's British Open in 2012. And stay tuned for more CaddyBytes.com inside the ropes stories, news, views come tournament week!